The Goben Family has been in the automotive business for more than 30 years. This car dealership is centrally located on Green Bay's East Mason Street and has a great selection of quality pre-owned cars, trucks, SUVs, and vans. Specializing in quality used cars, trucks, vans, and SUVs at affordable prices. Domestic and import makes and models can also be found at this Green Bay car dealership. Dan Goben may be new to the Green Bay area, but the automotive industry is nothing new for Dan Goben. The automotive industry has been a part of the Goben family since 1966, beginning with Dan's mother and father. Dan first began his journey as a car salesman, and over the years after experience and hard work decided it was time to open his own used car and used truck dealership. While his family has used car dealerships in Madison, Dan Goben decided Green Bay, WI was the perfect city for him and his business. Green Bay may be a smaller city than Madison, but Dan was looking for just that. He wanted a smaller city in order to have a more personal relationship with this staff, inventory and potential clients. All three make Dan Goben a great asset to the Green Bay community. Dan Goben not only hand picks each and every car, truck and SUV that makes its way onto his lot, but he also works on those particular vehicles on site. Every used auto on the Dan Goben lot comes with a 100 day, unlimited mile warranty. With that in mind, Dan Goben will not sell any car or truck he can't personally guarantee. No other used car dealership in Green Bay offers a warranty like that. The makes and models of autos at Dan Goben vary, but one aspect will never change. Dan Goben specializes in late model leases, 2 to 4 years old, with miles ranging from 30,000 to 80,000. Since opening its doors on November 1, 2011, Dan Goben had a gimmick to drive people in: test drive a used auto and get a free football. Now, that gimmick is no longer needed. People come in because they have learned that Dan Goben sells quality used cars and trucks. They have also learned that Dan listens to his clients. Dan has said that while many people come in with no make or model of a car in mind, more and more are coming in looking for hybrids. Because Dan is so hands on with his business, he can in turn seek out more hybrids to bring into his inventory. Truly a win-win situation for Dan and his clients. With around 40 or so used vehicles in his inventory, Dan Goben has something for everyone. 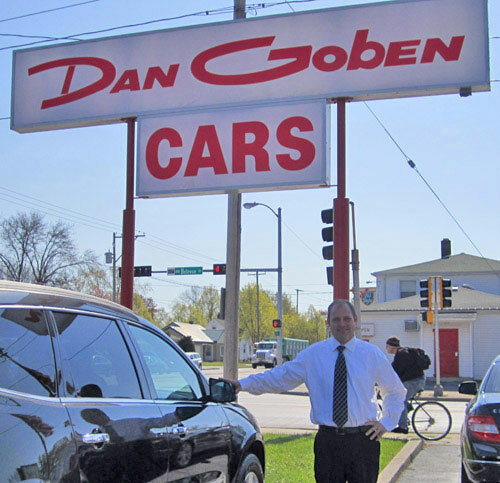 Even though this used car dealership is young, the future of Dan Goben looks bright. Green Bay, WI is lucky to have such a gem like Dan Goben.